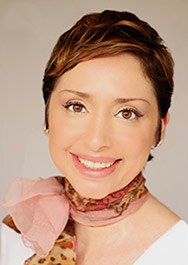 Expert Esthetician Rita Mondolfi sets her self apart with her results oriented approach to skin care. Her passion for gentle, yet effective solutions has earned her a cult following in the world of beauty. From the beginning, Rita has focused on beautiful skin combining plant-based ingredients and science together for an approach to tackle the skin from all angles, feeding the skin what it needs to thrive and transform into glowing, healthy skin! Rita began her career at a very young age in her grandmothers garden, toiling away in a mediterranean oasis filled with all kinds of flowers, roses, herbs, vegetable, lemon, orange and fig trees. Her grandmother would teach her about every plant and at various times in the day they would pick certain ones to bottle, creating beautiful facial serums, hair tonics and body lotions. As a licensed N.Y / N.J Esthetician, Makeup artist and Aromatherapist her passion and appreciation for beauty has inspired her to incorporate anti-aging results driven treatments! Rita's ability to treat a wide range of skin conditions customizing treatments coupled with her home care results driven regimen, keeps clients looking flawless!